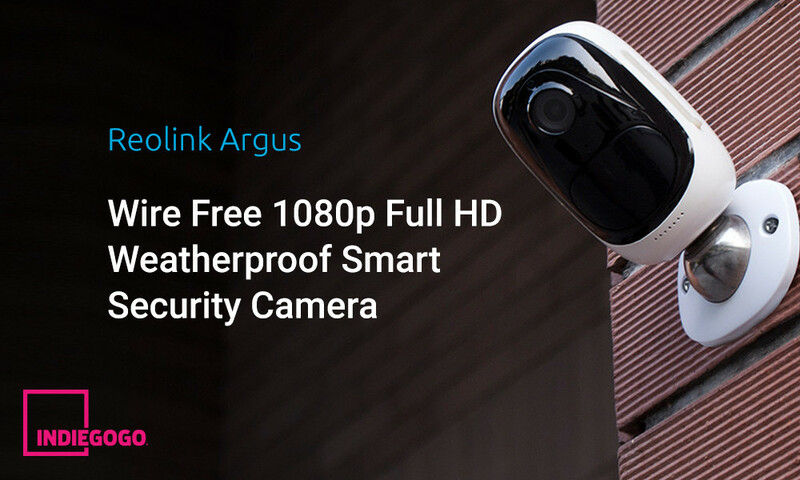 Reolink Argus - World's First 100% Wire-Free Weatherproof 1080p Full HD Security Camera Launch CrowdFunding on Indiegogo. Hong Kong, China, April 1, 2017	(Newswire.com) - ​​Reolink, a global innovator in home security and camera solutions, has launched Argus – world’s first 100% wire-free weatherproof 1080p HD security camera on crowd-funding site Indiegogo. Go to https://www.indiegogo.com/projects/reolink-argus-truly-wire-free-security-camera-technology--2#/ for detailed info. Starting from $72 for the early bird special, Reolink Argus is a world’s first 100% wire-free weatherproof 1080p HD security camera, a completely standalone & portable indoor & outdoor smart security camera. "After months of fine tuning and optimization, we launched our feedback program and finished its final touch on Argus, now we can't wait to share with Indiegogo community and have them help nurture this unique and smart security camera with us." Said Reolink CEO Mr. Liu. “After months of fine tuning and optimization, we launched our feedback program and finished its final touch on Argus, now we can’t wait to share with Indiegogo community and have them help nurture this unique and smart security camera with us.” Said Reolink CEO Mr. Liu. Reolink Argus is set to take tricky issues common among battery-powered security cameras head-on, say, short battery life, constant wrong motion alarms, limited viewing area, etc. Besides, combining 100% wire-free, long battery life, waterproof, built-in PIR motion sensor, two-way audio, Full HD videos day & night, and more features, Reolink Argus defines what a top battery operated video surveillance camera should be. 100% Wire-Free - Free from ugly cables and wiring hassles. No need for base stations, place it in your baby’s or pet’s room, porch, etc., indoor & outdoor. PIR Motion Sensor - Highly sensitive sensor detects human movements and provides almost no false alarms. IP65 Waterproof Indoor & Outdoor – Weatherproof to withstand outdoor environment and guard your property no matter rain or shine. Two-Way Audio - Listen in to what’s going on and talk back through the built-in microphone & speaker. 1080p Full HD - Deliver crystal images/videos in true 1080p Full HD and stream live feeds in HD, no grainy or blurry images/videos. Instant Motion Alerts - Get instant app push notification, email & sound alerts when motion is sensed. 130˚ Wide Viewing Angle - Provide a wider field of view, cover more areas, and reduce blind spots. Free & Intuitive Reolink Apps - It sends you alerts, allows you to pan and tilt, streams live video and allows you to record or capture images with the click of a button. Rapid Wake-Up - Wake up at once when being accessed via mobile apps or movement is detected. Long Battery Life - Advanced power-saving technology support up to 180 days standby time, frees you from frequent battery change. Decent 33 feet Night Vision – HD quality camera with built-in infrared LEDs enables users to see up to 33feet at night or low light conditions. You can back Reolink Argus on Indiegogo page now, starting $72 for the Earliest Bird, $80 for Super Early Bird adopters, $152 for 2 Reolink Argus Super Early Bird, the more support you offer, more discounts for early supporters. Source: Reolink Digital Technology Co., Ltd.
About Reolink Digital Technology Co., Ltd.
Reolink Digital Technology Co., Ltd. is a world leading professional high-tech company providing security products and solutions worldwide. Press Contact Reolink Digital Technology Co., Ltd.